Small Tweaks Improve The Game Even More! Yes! Dysfunctional Families is currently 5861% funded! I just wanted to say Hi to you and thank you for being a part of the Dysfunctional Families success story! One of the great things about running a Kickstarter is getting feedback on the prototypes of the game and thus being able to make an even better game. My friends Wayne and Ruth playtested Dysfunctional Families with their family, and Ruth came up with a good suggestion to improve the game. Ruth was playing with a lot of people and noticed that the turns tended to get clumped with a few people — with who was the asker going back and forth between those people. They all were trying to complete the same families and they realized that they were the only players holding members of those families. Her youngest daughter got a little antsy waiting for this back-and-forth to finish since no one asked her for cards for a long while. This is exactly the type of problem to solve during a Kickstarter campaign! Ruth came up with a great solution, which I am implementing now into the game. Ruth’s idea was to have a few Power People cards that could be played any time to interrupt the current asker and change the asker to be the person 2 players to the left of the current asker, or change the asker to be the youngest/oldest player, or some other random selection. Ruth also liked how the Power People cards moved cards around and thus broke knowledge chains. What breaking knowledge chains means: By listening to what cards someone is asking for and noting what cards they get, you can figure out what cards they are likely holding. 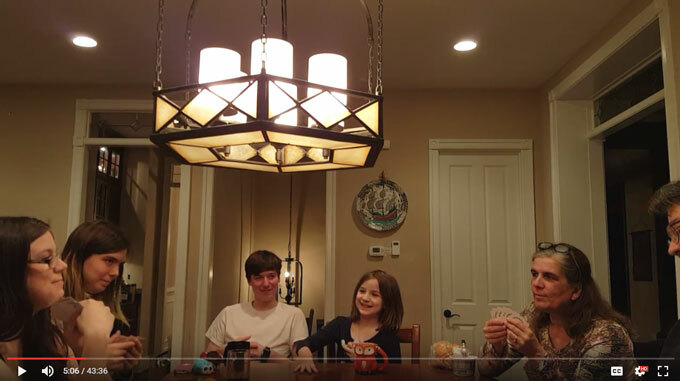 When a Power Person card causes cards to randomly move around the table, those partial families can be broken up and new partial families formed, thus changing who is closer to completing a family. 1 – The Power People cards that help shake things up and fix problems with the original game format. Just like they solved other problems, I can make a few of the Power People cards be interruption cards to solve the problem Ruth experienced. 2 – The requirement to do a little improv sentence to ask for a card. It seems to bring out the funny in people! So far, both of those additions have been very well received, and I think they make Dysfunctional Families a much better game. In a future post, I’ll write more about the history of the Happy Families game and how I came up with the changes that I did to help bring it into the 21st century. All backers are welcome to download and play with the Print & Play version of the game (link available in Backer Update #1) and please message me with any comments or suggestions you come up with. Thank you again for being a part of the Dysfunctional Families Kickstarter Launch. Please share this Kickstarter with your friends and family on the internet — facebook, twitter, etc. — and also in real life! This Kickstarter backer update originally appeared here.